Omaha’s art lovers craving the objects of their affection generally know where to find them: museums, local art centers and galleries. And as Spring beckons us outdoors we are naturally drawn to public art in all the right places: civic squares, city parks and university campuses, as well as on the sides of many commercial buildings, given the Metro’s current muralist craze. Yet, as we come out of our long winter’s nap and begin to traverse the city again, it might surprise you to know there is a great deal of public 2D and 3D art to be enjoyed “in all the wrong places.” That is, publicly accessible art where you might least expect it, a sort of value added attraction. Three sites with a concentration of interesting contemporary work have emerged in the last decade: Lauritzen Gardens, Hilton Omaha and two buildings on the University of Nebraska Medical Center campus. What follows is a peek at the offerings of each. Since it opened its Visitor and Education Center in 2001, Lauritzen Gardens has included various forms of art in its offerings, both in its gift shop-adjacent gallery and, on occasion, in other indoor and outdoor areas of its sprawling facility. Currently featured are the ever-popular LEGO sculptures of Sean Kenney. 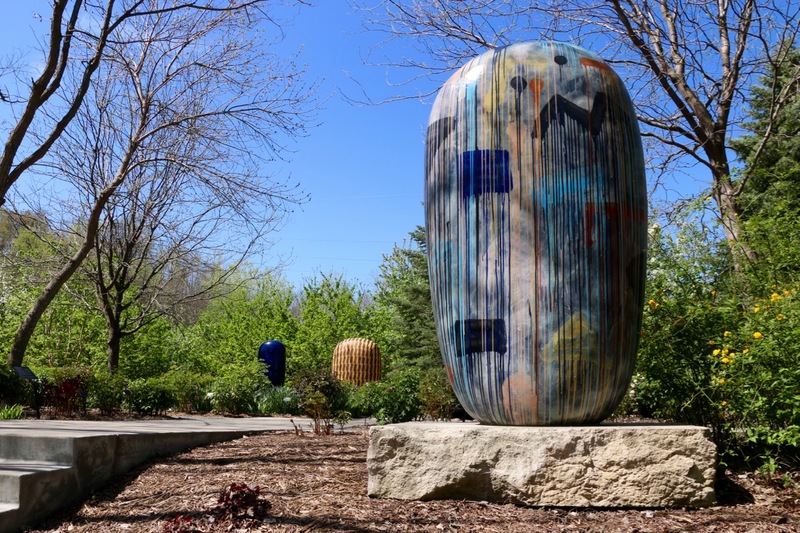 In addition to its growing collection of botanical specimens, Lauritzen Gardens also has an expanding collection of permanent artworks. Many are, as you’d expect, traditional types of garden sculpture: fountains, birds, children and such. But others await observant visitors. 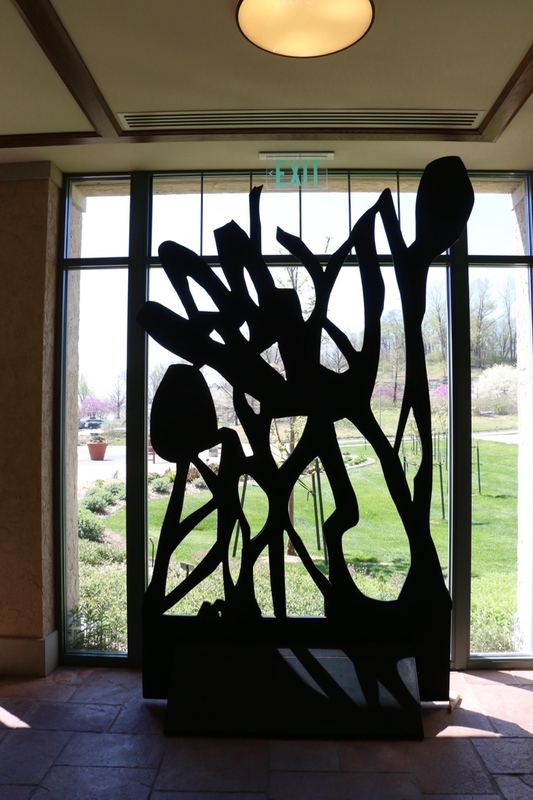 Lining the front windows of the Visitor’s Center is a suite of 6 black wooden sculptures by Catherine Ferguson. Characterized by silhouetted natural forms and undulating linear elements, “Nile River Foliage” stems from Ferguson’s designs for the 2008 Opera Omaha presentation of Aida; the screen-like sculptures were added to the garden’s collection after a related exhibition there. Similarly, the 2011 exhibition Outdoor Kaneko prompted the purchase of 3 of the ceramic artist’s signature human-sized Dangos. You will find them arranged in the Tree Peony Garden where their bright colors and vivid patterns enliven the space long after the showy spring blooms have faded. There are other hidden gems in the gardens, including works by Deb McColley, Iggy Sumnik and Dan Whetstone. 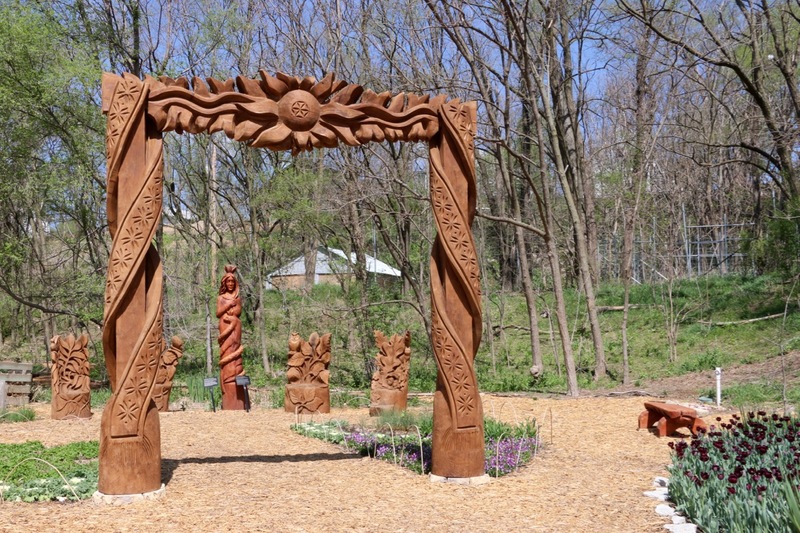 And be sure to check out the Children’s Garden for its growing grove of charming Lithuanian wooden folk sculptures, part of an effort with the sister of city of Šiauliai. “Egle-Queen of the Snakes” by Aurimas Šimkus was completed on site in 2015. Despite its art programs, Lauritzen Gardens is a little shy about its permanent holdings. Ferguson’s sculpture has no obvious label, maps do not flag sculpture locations and art tours only happen as parts of specific events, such as the recent International Sculpture Day. But the gardens are open to be explored by the public daily (there is an admission charge for non-members). Hotels aren’t generally known for having thoughtfully curated art displays. Big corporate hotels tend to make décor purchases whose aesthetics range from merely inoffensive to annoyingly trite. When the city-owned and bond-financed downtown Hilton Omaha was in development, a different idea was hatched: why not put regional artists to work as well as local contractors? 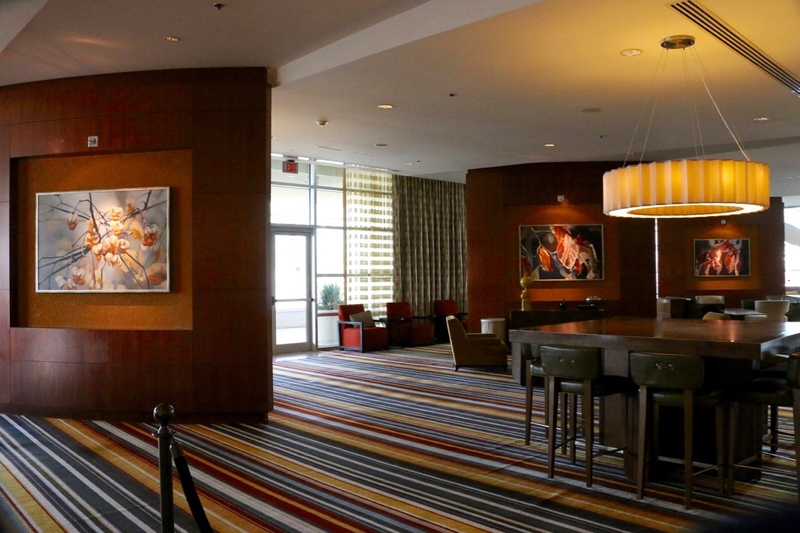 On its opening in 2004, Hilton Omaha boasted a collection of about 50 artworks by 22 artists, nearly all accessible to the public 24/7 in entrance, lobby, restaurant and 2nd floor meeting room lobbies. With a building expansion in 2012, more works have been added. The list of artists is reasonably familiar: Jacquie Kluver, Karen Kunc, Larry Roots, Terry Rosenberg and Colin Smith, among others. There’s a balance between artworks which speak specifically about Nebraska and those that are simply non-representational. Your expectations to see several works by Jun Kaneko will be rewarded: 6 wall slabs hang over the front desk and a pair of bronze and stainless heads is an east lobby feature. It’s worth remembering that the Hilton provided Kaneko’s first local outdoor commission: 5 trademark Dangos sit on striped plinths in a circular plaza at the Cass Street entrance. The great lobby also highlights six canvases of Iowa painter Rein Vanderhill. His suite features sun-dappled close-ups of fruits and flowers dangling from trees and plants. Their arrangement in the north lobby seating areas on opposite sides of angled walls encourages viewing from near and far. Throughout, there’s a generous selection of Larry Sosso’s whimsical work. 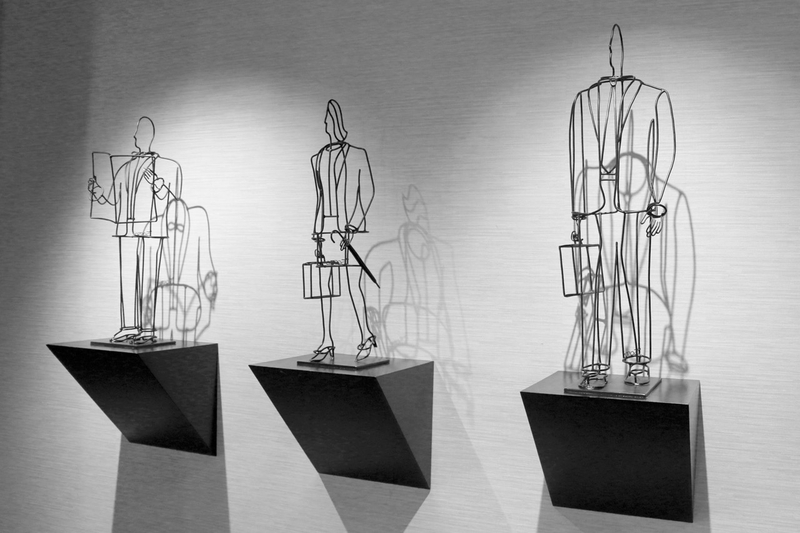 A small sculptural trio of human figures fashioned from bent and welded steel, located near the 2nd floor elevators, reflect the business types you might see at a convention hotel. Elsewhere, Sosso’s drawings outline torsos of men and women. For better or worse, his art been employed as a wayfinding device, located outside restrooms or as signposts at elevator banks. On the whole, the collection is satisfying and well presented, though it will never be accused of being the daring program offered by the 21C boutique hotels. There is a small collection guide available at the concierge desk (if you ask), though it has not been updated. Hilton would be well served to mount labels next to its artworks to overcome this deficit and call attention to the fact that it has created an intentional display. Visual culture lovers anticipate finding art on university campuses, but it’s probably safe to say that we don’t think of the Med Center in the same way, as most of us experience it via the services it offers: doctors, labs and hospitals. In the last decade, however, a concerted effort has been made to engage the public with contemporary art at two of its recent buildings: the gathering spaces in both the Michael F. Sorrell Center for Health Science Education (2008) and the Harold M. and Beverly Maurer Center for Public Health (2011) are filled with work from the region’s finest and are accessible on weekdays. 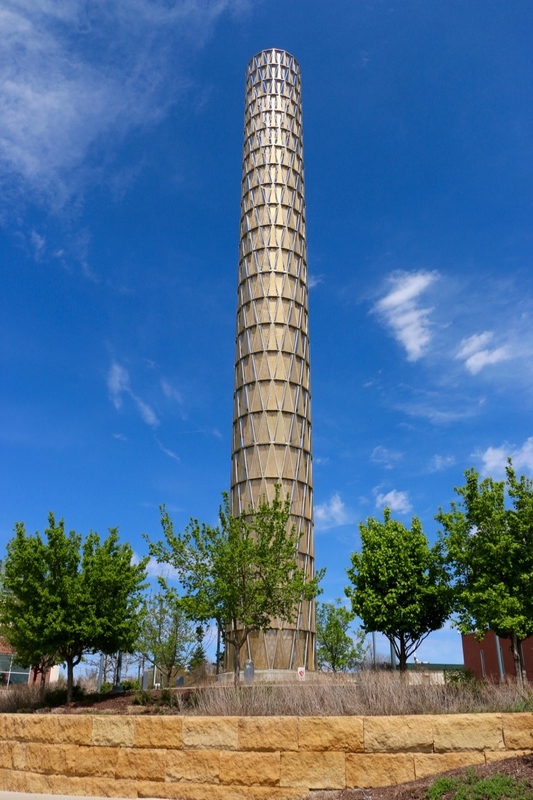 These privately funded initiatives, whose principals are active in the art community, certainly represent a culture shift from the near debacle that was the dismantling of a publicly funded Alice Aycock sculpture, in the way of campus expansion in the late ‘90s. 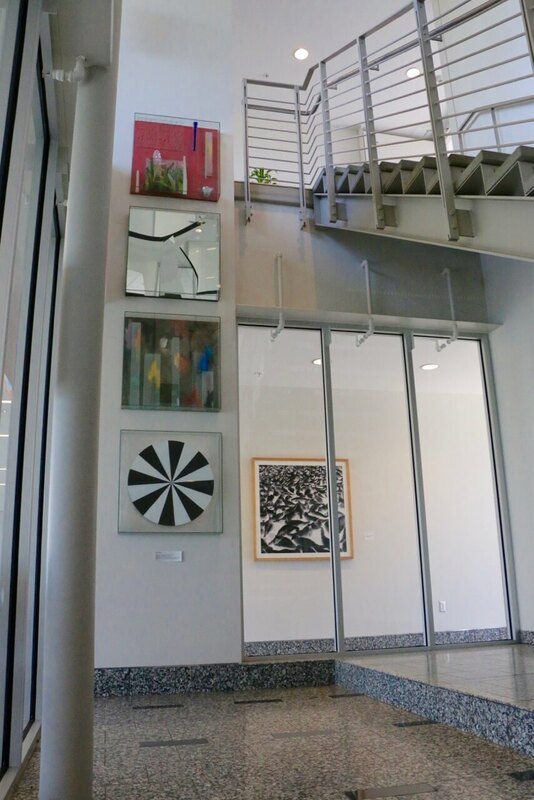 Most of the accessible art in the Sorrell Center is found on its second and third floors. 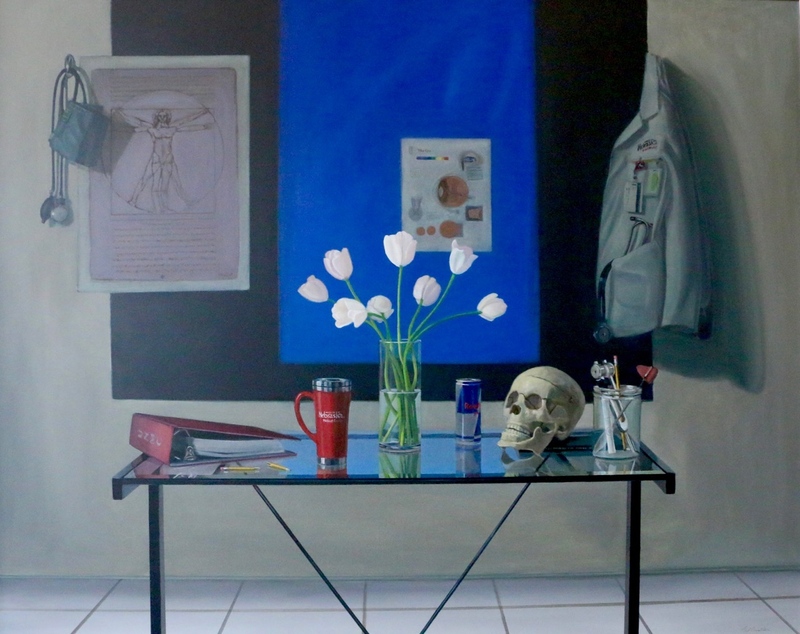 Some works are obviously commissioned, including a Steve Roberts painting of the building’s namesake and a Neil Christensen still life “The First Year”, featuring items pertinent in the life of a medical resident. 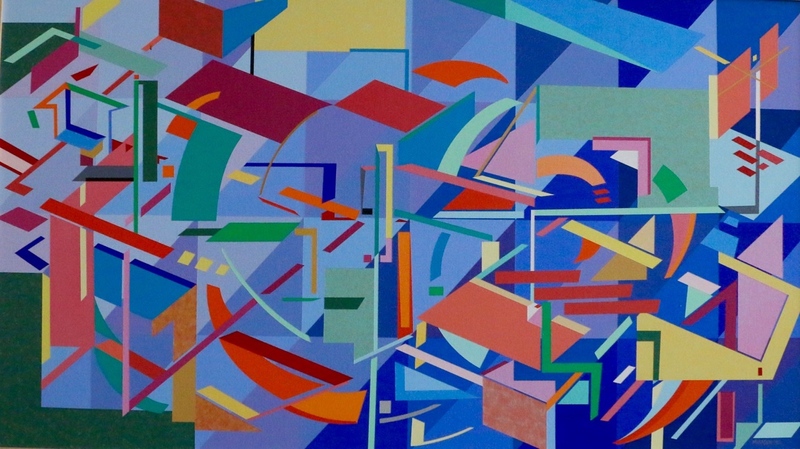 Among other works of note are an abstract geometric painting by Lincoln’s Marjorie Mikasen, a dreamlike watercolor by Creighton professor John Thien, and an intricate fantasy etching by Kearney’s Victoria Goro-Rapoport. Unfortunately off view were four large paintings by Mark Gilbert that stemmed from an earlier UNMC art initiative, Portraits of Care. The collection is also enhanced by loans from Nebraska museums. Joslyn has lent a selection of mostly historical works by artists associated with the region, including Karl Bodmer, J. Laurie Wallace and Allan Tubach. The Museum of Nebraska Art has a changing exhibition program in another hallway, currently devoted to contemporary art from its collection. Walking up the hill separating the Sorrell and Maurer Centers, there are several sculptures to enjoy, including a Kaneko installation, a Fletcher Benton steel alphabet letter. Hardest to miss, however, is the 120’ tall perforated steel and light “Hope Tower” by James Carpenter, accomplished artist/architect/designer based in New York. This feature wows during both daylight and evening hours. Next door at the Maurer Center, an impressive selection of art from artists with Nebraska ties is found on all levels and building stairwells. Glass artist Therman Statom, a California transplant with a national following, is well represented with both wall-mounted works and functional benches. Look also for works by “Omaha alums” Leslie Iwai, Jim Krantz and Claudia Alvarez, whose haunting painting “Boy Smoking” is perhaps the most provocative work on view. Once opened, neither facility has widely trumpeted the existence of these collections, though they get props for labeling them appropriately. Perhaps that will change with the dedication of the Buffett Cancer Center at the end of May, which features a Dale Chihuly sanctuary, a Kaneko glass tower, four commissioned artworks through the Nebraska 1% for the Arts program, and other objects as the opening salvo of its Healing Arts Program. One can only hope this trend continues. MoNA has extended its art program to the Methodist Women’s Hospital. Principals with the new Capitol District Marriott have been seen shopping for art. MCC’s Ft. Omaha campus has an open call for submissions for some large outdoor work. Just goes to show, art is all around, if you keep your eyes peeled.